When poverty and faith meet they frequently generate inventiveness and creativity. This is the case for some of the more beautiful samples of straw nativities from the Tzintzuntzan region of Mexico. The artist of this set Bernardino Marquez is a master weaver who created some beautiful figures with a most ordinary material straw. Decorative on large surfaces and intricate where small features are concerned the artist's weaving produced figures of great simplicity and dignity. Admire Joseph with his blooming staff the gourd hanging from its top a pilgrim's hat (patterned after St. James') on his head. A golden glow emanates from this straw set as if the ordinary material was ennobled by the noble purpose it served. As for the meaning of this nativity set God is able to make beautiful things from humble beginnings. 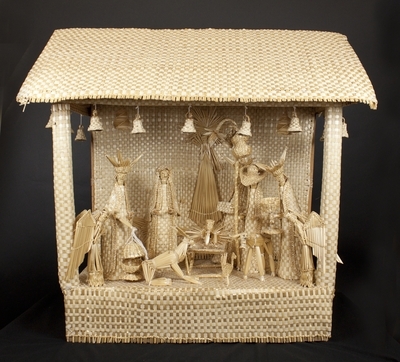 Nativity scence depicting the nativity of Jesus, woven from wheat straw by Bernardino M. Marquez in 1995 innTzintzuntzan, Mexico. Exhibition label originally written by Fr. Johann G. Roten, S.M. for exhibit entitled "At The Manger" and held at Roesch Library, University of Dayton.